If you are among the 178 million Americans missing one or more teeth, you can make a true investment in your smile with dental implants in Cambridge. Dental implants have quickly become the preferred solution to treat tooth loss because they offer over a 95% success rate. With them providing a lifelong option for a complete smile, more than 500,000 dental implants are placed each year. If you are considering this option to replace your lost teeth, your top question probably involves the cost. Although dental implants do cost more than traditional tooth replacement options, they will pay for themselves as the years go on. Dental implants are composed of three main parts: an implant post, an abutment, and a dental crown. The implant post is surgically implanted into the jawbone to replace the root of a tooth. Using a biocompatible material, the jawbone naturally fuses to the post. This allows the implant to permanently treat tooth loss as it will never need to be replaced with the right care. After the jawbone heals, an abutment is attached to the implant post. This is needed to allow the gum tissue to heal correctly while also anchoring the dental crown in place. A couple of weeks after the abutment is placed, a custom-made restoration is attached. As an implant dentist in Cambridge, we routinely offer our patients this option to replace their teeth. The cost of the procedure is based on several factors, such as if additional procedures, like tooth extractions or bone grafting, are needed. In addition, cost is also influenced by the number of teeth being replaced and the materials used. On average, the cost of a dental implant in the United States is roughly $5,000, which includes the out-of-pocket costs for the implant, abutment, and crown. However, in some cases, insurance may cover part of the procedure, such as if a tooth extraction is needed. The price of dental implants is influenced by various things. For example, the consultation necessary for treatment is far more extensive than that of dentures. In addition to a visual examination, you will also need detailed imaging, which increases the cost. You will also need multiple appointments as it is a multi-stepped procedure. The first phase of treatment requires surgery, which uses a general anesthetic. Since you will be asleep through the procedure, this increases the cost. In addition, a general dentist cannot perform this step. You need to see an implant specialist, such as an oral surgeon, who has special training in implant dentistry. This specialized area of care does tend to cost more than the basic services offered with a general dentist. The materials used to replace a tooth impacts the final cost. 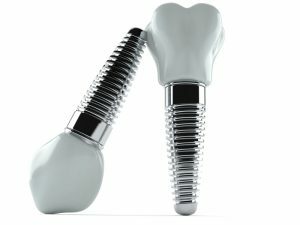 The dental implant post can cost anywhere from $1,600 to $2,000, while the abutments are around $275 to $450. The crown to replace the tooth tends to be the most expensive, costing as much as $3,000. Although dental implants can seem quite expensive, they will pay for themselves over the years.With other forms of tooth replacement, you will need new a prosthetic made every few years, such as with dentures. Not to mention, other solutions do not protect your oral health as well as dental implants, so you can expect additional dental costs. However, the long-term benefits of dental implants keep your dental costs to a minimum because they last forever while promoting your oral health. Do not let the price of the procedure detour you from replacing your lost teeth. Contact Muskingum Valley Oral Surgery today to schedule a consultation.